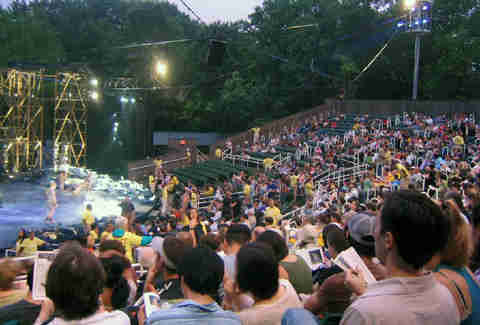 Twice every summer, a certain phenomenon happens wherein hundreds of eager nerds descend onto Central Park’s open-air Delacorte Theater for the totally free, totally accessible NYC tradition known as Shakespeare in the Park. Rain or shine, world-class actors and... Billy Crudup... take to the stage to give life to classic productions for an enamored audience that probably hasn't brought enough bug spray. And the beauty of it all is that anyone can get access (mostly for free!) to these esteemed, everyman performances if they try hard enough. Here are the nine ways to secure tickets. 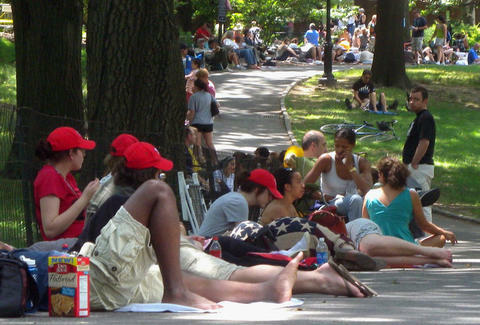 Arguably the most legitimate way to guarantee yourself entry is to become a Summer Supporter and buy your ticket on publictheater.org. $200 gets you one reserved seat for a single production, $400 gets you two, $600 gets you three, and so on. If you value your money more than your time, you can wait in line for free, randomly seated tickets that the box office hands out at 12pm the day of the performance. But you can’t just show up to the park -- far from it. These tickets are so coveted that people start lining up outside the 81st St entrance, the closest one to the Natural History Museum, at around 2am, to patiently wait for the park to open... at 6am. Now, each individual (age 5+) in this line will get two free tickets, until they run out. So you could come with your crew and camp out. And if you do, tents, lawn chairs, blankets, blow-up mattresses, snacks, wine, and playing cards are all integral. But what you should do is tag-team. Have one person go at 2am to post-up with Netflix for a few hours and use up all their data, and then have the other arrive halfway through -- you don’t want to be too tired for the show, after all. Take note, though! If you’re among the last in line, you still might not get a ticket. Bypass the whole campout with a Craigslist hire; though if you’re caught, you could be refused admission. Some people wait in line to resell them, which is heavily discouraged. We’re not really advocating this route, but like, supply and demand. This is all around a ridiculous idea because if you’re willing to drop $300 on a scalped ticket, you might as well support the actual show for $200, dumb dumb. Make an account on this website, enter the lottery and request two tickets (you’re allowed no more), and find out at noon that day if you’ve made it. If you do manage to score some, you can pick up your tickets at the box office between 5-7pm the day of the show. After 7, your tickets will be released to the stand-by line. After the final ticket is distributed for the day’s performance, you can try your luck waiting for the leftovers at 6pm. If and when tickets become available, one free ticket per person will be dished out. On specific dates, a limited number of vouchers for that night’s performance will be distributed at locations throughout New York’s five boroughs. Check back here for details! Often, big companies will donate a whole bunch of cash in exchange for a whole bunch of tickets. Find out if your company does this and take advantage! If not, convince your boss it’s good for morale. A picnic in Central Park beforehand is key. There’s a concession stand, and you are allowed to bring alcohol in as long as it’s not in a glass container -- but be warned: the bathroom line is outrageously long, and should the urge strike, you might miss half the show. Wait around for a little after the performance for the actors to come out so you can say hi. And! Rumor has it they all go to Fred’s on the Upper West Side, presumably for cornbread-blueberry mini-muffins. Carrie Dennis is an Associate Editor for Thrillist and will be tag-teaming this summer. Follow her on Twitter @CarrrieDennnis.